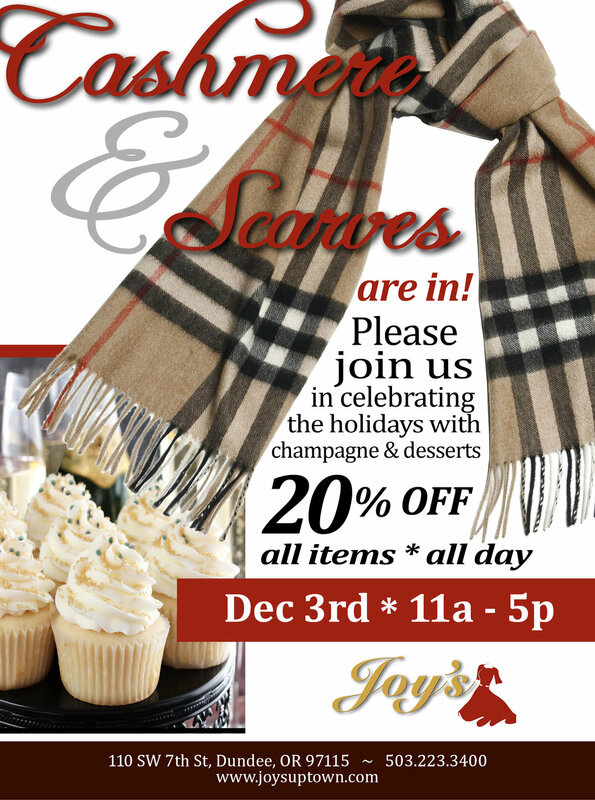 Make sure your Sunday/December 3rd plans included swinging by Joy's Uptown Style for some holiday cheer! We'd love to share a glass of champagne and a holiday dessert with you, while you discover the new Cashmere and Scarves that just came in! BEST OF ALL: 20% OFF All Items/All Day! Don't miss this chance to do some holiday shopping for a loved or for you, and bring a friend! It's time for a holiday treat - we look forward to seeing you! HOLIDAY SHOP HOP IS HERE! Get out your holiday planner and think about where you'll be these holidays and how you're going to want to look your best - while being comfortable. A favorite shopping experience is happening this weekend! We're open 10am to 6pm both days. Small bites and complimentary wine for those who attend. Best of all ~ a fun drawing for a beautiful jacket! FABULOUS FALL FASHIONS ARRIVING NOW! We just wanted to remind you that our Fall Fashion collection has been arriving at Joy's Uptown Style! Gorgeous Colors and Styles, Sweater Jackets - everything you need to look beautiful while staying warm and cozy. Please come visit us at 110 SW 7th St, Dundee, OR 97115 and you can reach us at 503.223.3400. We look forward to seeing you soon! historic Dundee Community Center Restoration fundraiser/ joy's uptown style 2017 spring fashion show ~ IS april 23rd! Joy's Uptown Style cares about our Community - and here's how she shows it: with a gorgeous splash of color and style in her much-anticipated 2017 Spring Fashion Show! As you will read below, space is limited and reservations are on a first-come first served basis. RSVP to 503.688.6735 and get your ticket soon. And it gets even better ~ there's even a drawing for a $100 Joy's Uptown Style Gift Certificate! DRIVE ME TO DRINK WINE TOUR! You've marked your calendar and just selected the perfect outfit for the occasion - now it's time to design the custom-made Drive Me To Drink Wine Tour to CELEBRATE! We appreciate that you come to Joy's for all of your fashion hopes and dreams - now we would like to say Thank You by offering you special pricing on your next Custom Designed Wine Tour. Please call Joy for more information at 503.233.3400 ~ then Book your Wine Tour Today and make this a celebration to remember.